Day 6: Woke up to see clear blue sky, and the blue water right in front of us - it was super cool. Our rental was an ocean-front unit, and we had views of the ocean from everywhere in the unit. After having some home cooked breakfast, we spent some time watching the waves. There were rocks where the ocean ended, so we saw abundant sea-life. Schools of fish of various colors and sizes were visible every time a wave rose, and we also saw a few sea-turtles near the rocks. It was so awesome, we were just incredibly happy. For lunch, we headed to Wasabi's nearby - which was a good sushi place. Nice vegetarian options too. The tour also included pick-up and drop-off from our rental place, some food to eat and large coats and gloves once you're at the summit. We got picked up around 2 pm in a large van - and headed to Mauna Kea. By the time we picked up everyone else (around 12 people) and headed up Mauna Kea it was past 3 pm. We reached the first stop, the Mauna Kea visitor information center around 4.30 pm. This is around 9000 ft from sea-level. All visitors usually stop here for at least half-hour to acclimatize to the elevation. We got a bento box to eat here, and some hot miso soup. I drank some hot tea as well - to keep myself warm. 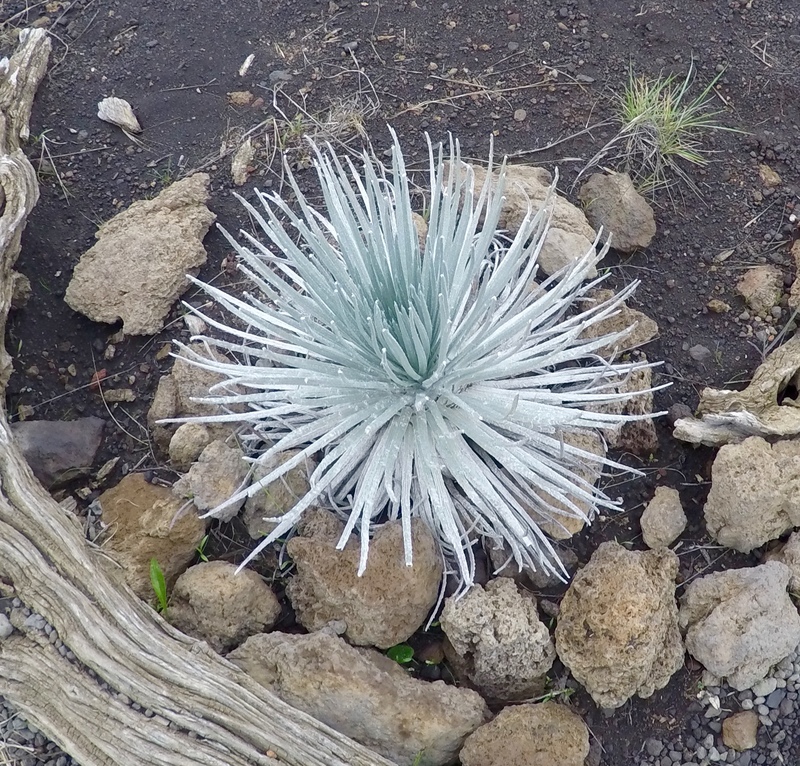 There's a native hawaiian plant, silversword that thrives at this high altitude - that the government is trying to restore (I'm guessing the feral pigs are destroying that as well). There was a small walk-way near the vistor information center to see this plant - which we did. As the name suggests, it did have thin leaves which looked like tiny swords. We also took a look around the visitor information center - which was running a video of some of the observatories located on the summit. 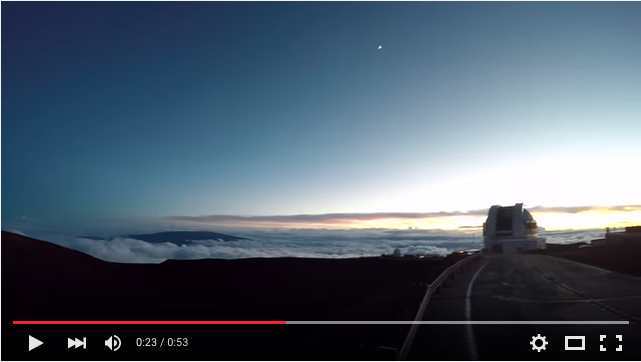 Since the location is ideal for astronomy, there are observatories from different countries located there. Continuing our tour, we started around 5.30 pm from the visitor information and headed up. Our first stop was at National Radio Astronomy Observatory (NRAO) which had an antenna shaped thing that included a VLBA. As I understood from what I read there, these antennas helped astronomers make detailed studies about celestial objects. Here's a picture which includes our shadows, but in general the entire area felt very alien to me. Of course, it was cold as hell too. We reached the top of the summit around 6 pm. Our tour guide told us that we could spend 45 mins here and watch the sunset. As we stepped out and saw the view in front of us, it was incredible. There were tons of clouds beneath us, and just the blue sky above. The sun had just started dipping into the clouds, so it was turning a little dark. You could also see observatories (which were white in color and round in shape) all around too. It was definitely an aha moment. Of course, being at the highest point (13,796 ft) it was freezing cold. Thank god for the huge coats and gloves, else I would not have survived 45 min there. That's me with the red gloves on the summit. We took a few pictures, and then found a nice spot to watch the sunset. Looking around us - it was clouds all beneath, and as the sun was going in, we could see the colors in the sky change. 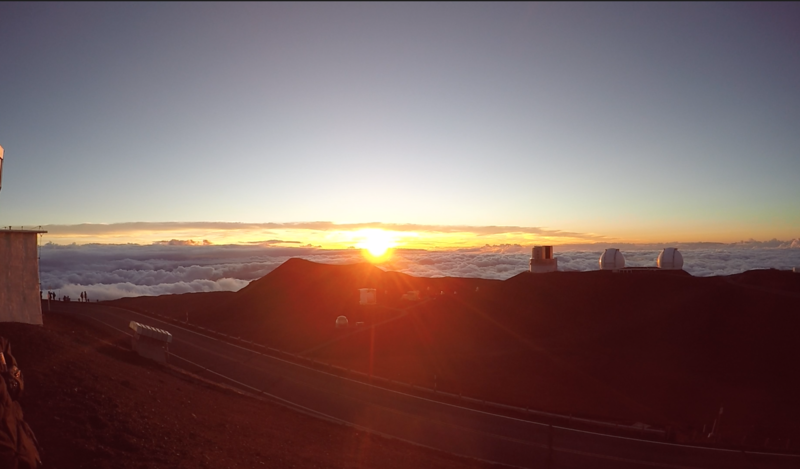 You would never think that watching sunset would mean that you would see the sun dipping into the clouds below it, but at this height - that's exactly what it meant. Just around 6.45 pm - a few minutes after sunset, we headed back down. It was good, because I started getting real cold. We went back down to around 10000 ft and spent some time in the van, while our guide set-up the telescope for star-gazing. After a while, our guide asked us to step out - and there was another aha moment right there. It was the first time I was seeing so many stars in the sky. There are probably zillions of stars in the sky. The Milky Way was clearly visible from the naked eye. It was spectacular. You'd actually never think there were these many stars in the sky - but yes there are. As far as the eye can see and more - it's just stars and more stars. Our guide started showing us some stars from the telescope - and it was certainly very informational. I remember seeing Saturn (with it's ring) from the telescope, and thinking that it was truly beautiful. We also saw a few star formations - scorpion and libra. We took no pictures or videos here - we were not carrying an SLR and neither of us were astrophotographers. In any case, here's a link to some pictures from google. Be prepared to be wowed - but still, the pictures do not do justice. After spending around an hour star-gazing, we went back into the van and headed down. Spending an hour star-gazing is just about right I think - considering it is around 10000 ft, so it is still very chilly. It was past 10 pm when we got dropped back. 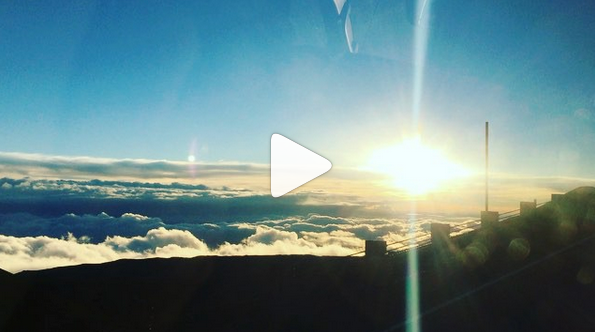 You don't need to book a tour with a tour company, you can drive up Mauna Kea yourself. There are two levels you can go - one at 9000 ft (the visitor center), and another at 13000 ft (the summit). You need to have a 4WD to drive up to the summit, however, you can drive to visitor center in a 2WD. Be prepared to cope up with some altitude sickness. It is real, and it affects everyone - whether you're driving by yourself, or taking a tour. Drink a lot of water, and keep yourself hydrated. Jack's tour cost us $350 for two people - including everything. 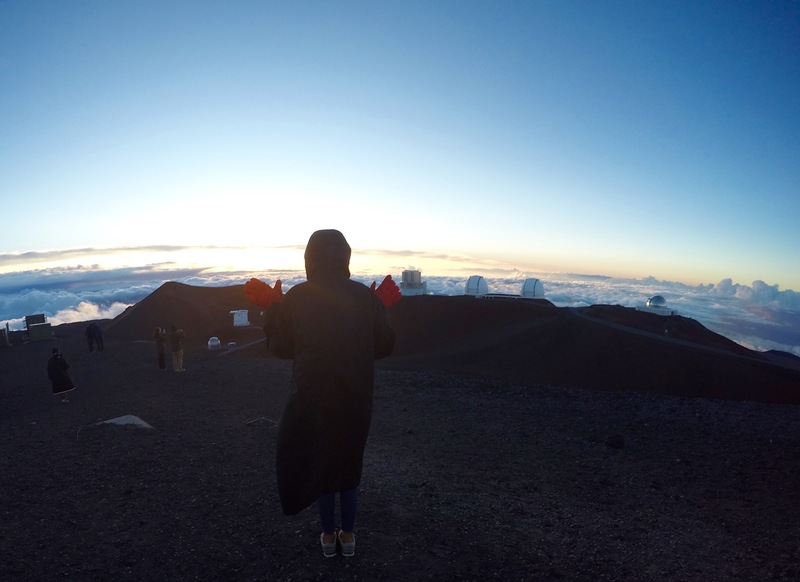 I would consider this one of the most out-of-the-world experiences I had, not just in Hawaii - but in my life so far. It's truly surreal.